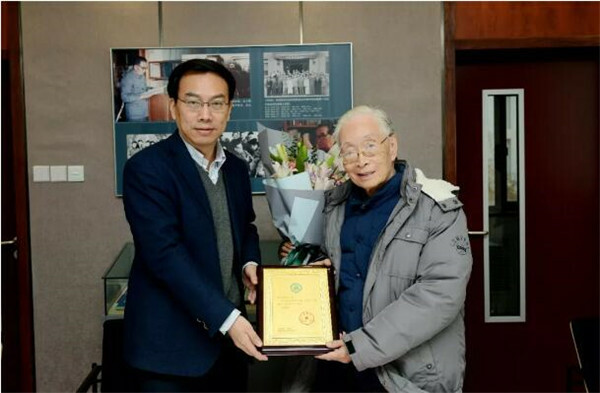 Yang Fuyu, a biochemist and an academician of the Chinese Academy of Sciences (CAS) donated his Shisan Pai Award at a meeting held at the Institute of Biophysics under CAS on Dec 20. Xu Tao, president of the Biophysical Society of China (BSC); Xu Ruiming, vice-president of the BSC, Wang Hongyan, Party secretary of CAS's Institute of Biophysics; Zhang Hong, secretary general at the BSC; Liu Pingsheng, director general at the BSC; and other winners of the Shisan Pai Award participated in the meeting. Yang shared his experience of working with Shitsan Pai (also called Shizhang Bei) and expressed his expectations that the BSC will undergo quality development. Xu Tao expressed his gratitude for Yang's support of the BSC over many years. According to Xu, the BSC has more than 10,000 members. He said that it will continue to live up to Yang's expectations and promote the development of the Shisan Pai Award. Xu Ruiming, a director of CAS's Institute of Biophysics, introduced the progress the BSC made during recent years and stressed that the development of biophysics in China was due to the efforts of scientists like Shitsan Pai and Yang Fuyu. He also urged younger generations to learn from their predecessors so as to further promote the development of the BSC. The Shitsan Pai Award, the top award of the BSC, was launched to celebrate the society's 30th anniversary in 2009. It is given every two years to recognize excellence in biophysics research. It usually goes to one BSC member while the Shitsan Pai Award for Young Biophysicists is given to one to three BSC members under the age of 35. Candidates should obtain written recommendations from at least two executive directors or specialized committee directors, or at least six directors of the BSC. Entries are reviewed by a jury comprised of well-known experts.